One of the first publishers of children's books to enter the field of movables, the London-based company Dean and Son created fanciful and charming pages, some featuring anthropomorphized animals. Stiff and sober as the Dean characters appear to modern eyes, there is a playful element in these scenes indicative of a relatively new trend in juvenile books in the nineteenth century. As children's book historian F. J. Harvey Darton has noted, these works aimed at providing amusement and pleasure for children, rather than simply serving as tools for instruction. Interestingly, however much these books delight children with their advanced technology, they firmly reinforce the moral and social context of the day. 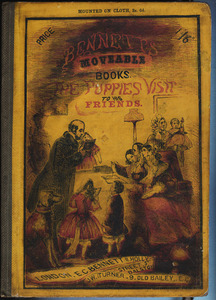 Dean and Son produced about fifty movables in the last half of the nineteenth century, making the publishing company the leading producer of such works at the time. Nevertheless, the cost of hand-coloring clothes and scenes most likely limited the edition sizes. 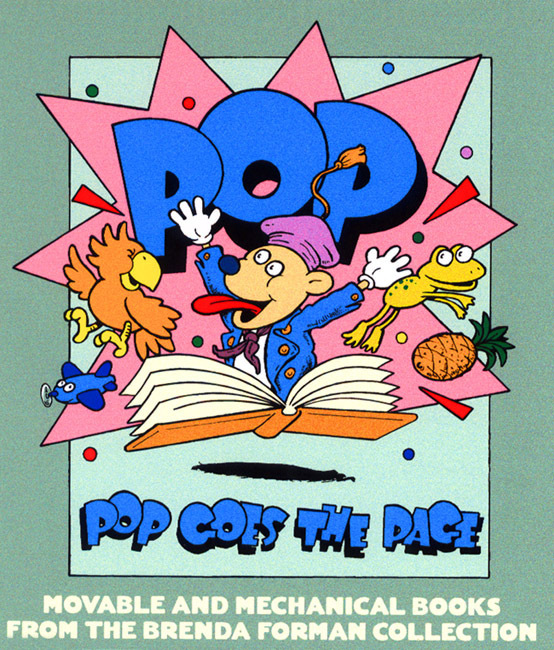 These books primarily use the simplest animation device--the tab. When the operator pulls the tab, characters spring alive. Suddenly dogs become dolls, players in a humanized drama, experiencing a full range of emotions, even the embarrassment of spilled soup on a favorite gown. Like paper-doll books, which enjoyed sustained success well into the late twentieth century, Dean and Son's publications provided the fundamental elements for children's fantasies: delightful characters, expertly drawn, in a framework inviting imaginative play. A Visit to the Country. Dean's "Surprise Model" Ser. 4. London: Dean, [1880s]. The "country" in this book is a far cry from rural simplicity. 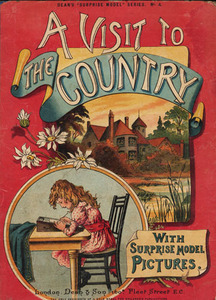 The children visit an aristocratic country estate, rather than a farm or village. This affluent setting affects all of their encounters with the bounties of nature (and culture). For example, the working domestics always appear flat in the background, and the scale of the dramas for the leisure classes never rises above "...a bough caught [Leonard's] shirt and tore it dreadfully." The "surprise model pictures" of the idylls and amusements of upper-class life depend on the use of strings that link the parts, creating a tension that pulls the images into place. The Puppies Visit to His Friends. London: E. C. Bennett, [1860s]. The popular convention of using young animals as a basis of stories for children most likely springs from classic Aesop's fables. The nineteenth-century sensibility that defines the anthropomorphic qualities of these animals instructs young readers in the social mores and expectations for decorum. Even with the improper spelling and punctuation of the title, this book clearly means to teach a child proper behavior. Dean's Moveable Dogs Party. London: Dean, [1850s]. 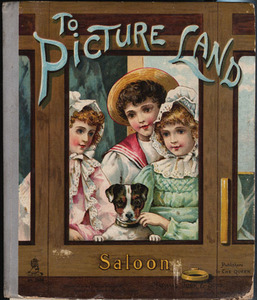 One of the early productions of Dean and Son, this book and The Puppies Visit to His Friends were printed letterpress and then hand colored using a "pouchoir," or stencil, method. Both works use simple tab devices to make the dogs' heads move. The monkey servants have a racist undertone, and the author indicts them for having "too much to say." An unfortunate footman even pays for his mistakes by being "discharged on the spot." As such, the story replicates the social order of the British Empire with its clear class divisions. Of course, it is unlikely any British aristocrat ever took as much pleasure in a "rat pie" as do these greedy canines. To Picture Land. London: Raphael Tuck, [1880s]. Raphael Tuck, born in Germany, came to Britain as a young man and established a firm as a fine art publisher. 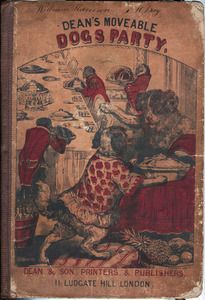 He created works in the 1870s and 1880s that further popularized movable books and competed directly with Dean and Son. Tuck's seaside, farm and country scenes became standards of the pop-up genre. The charm of these illustrations communicates an innocent pleasure in bucolic idylls.